It’s no secret that U.S politics has become massively polarized over recent decades. In the midst of political divisiveness, there is one area of common ground that has found consistent bi-partisan support in recent years, and that is Renewable Energy. It turns out that renewable energy has the power to bring people together in a way that few subjects do. In a recent Pew Poll, respondents conveyed (overwhelmingly) that they would prefer our country move in the direction of solar and wind power over all other forms of energy, including coal, oil, natural gas and nuclear. 89% of respondents say they would be in favor of more solar power, and 83% said they would be would be in favor of more wind power. It’s hard to find any topic that Americans agree on with such consensus. if Americans disagree so fervently on climate change, why do they agree so strongly on renewable energy? The answer may lie in how renewable energy is perceived by those with on different sides of the political divide. For liberals, Renewable Energy is the answer to Climate Change. Many liberals believe that moving to a renewable energy based society will ultimately lead to decreasing carbon dioxide levels in the atmosphere, and eventual reductions in global temperatures. On the other hand, many conservatives view renewable energy from an energy-security or financial perspective. 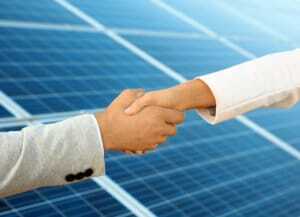 If a home owner or a business can save money by moving to renewable forms of energy, then the decision is simple. Most would agree that people aren’t in love with coal or gas, as forms of energy. For the past 100 years, these forms of energy have simply cost less than other options. Times are changing rapidly however; in many parts of the country, renewable energy is less costly than traditional energy provided by local utilities. Additionally, by adding solar financing to the mix, it is now possible for home owners and businesses to go solar with no upfront costs. Using instruments like Power Purchase Agreements (PPAs), many customers can reduce their monthly energy costs from day one without any money out of pocket. While the dramatic support for renewable energy in the U.S. can, at times, seem paradoxical, when you break down the perceptions behind the support, it becomes very clear why it continues to dominate the field for new energy development. 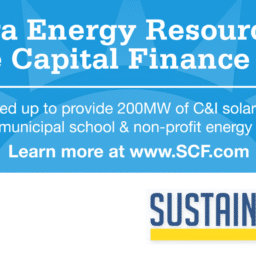 About Sustainable Capital Finance: Sustainable Capital Finance (SCF) is a third party financier & owner/operator of commercial & industrial (C&I) solar assets and is comprised of experts that specialize in structured finance and solar development. SCF has a vast network of EPCs and Developers across the US that submit project development opportunities through SCF’s cloud-based platform, the “SCF Suite”. This allows SCF to acquire and develop early to mid-stage C&I solar projects, while aggregating them into large portfolios. SCF has standardized the diligence and transaction process, thus creating cost-efficiencies and risk mitigation, in order to solidify the C&I marketplace as an investment-worthy asset class. For more information, visit https://www.scf.com. Connect with us on Twitter at @SCF_News and follow us on Linkedin and Facebook!